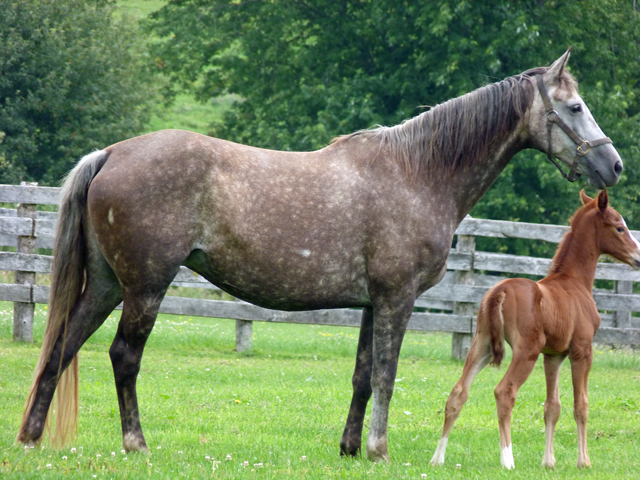 Iselle was imported from Germany in the fall of 2008, as a complement to the genetic base of our broodmare herd. This impressive mare with big, balanced body proportions, is by Sir Chamberlain, a show jumper stamped by his TB ancestors, out of Elite mare Ilonka, and carries bloodlines with proven athletic ability. The dam line of Ilawa has produced many award winning ofspring, and was bred and maintained to high standards by the Wasserman family. Ictenos, licensed S-level dressage stallion and 1998 Trakehner Riding Horse Champion has the same bloodline. So far, 5 of 6 female produce of elite dam Ilonka have achieved premium status, 2 have been awarded a state premium as well.